I’m officially starting the ticker to set heart transplantation schedule for my Mahindra Classic. The power of storm is not going to be installed but adequate increase will be made possible to the Jeep now. With in the next one week time the Jeep going wear a fine tuned heart. The current stock engine in the Jeep is Peugeot XDP 4.9 is a 2112CC (2.1 liter) 62BHP diesel motor. This engine is a wet liner and gear driven cam. The major problem that I’ve been facing with this engine is that of overheating, many have faced the same issue and I can feel my foot board always hotter. With the hot temperature outside and adding to the climate the cabin also heated up with the Peugeot engine most of the time I sit in the Jeep with sweat wetting my dress. Air-conditioning with the current engine is not going to be possible as the engine may burn to death. I was looking at various options such as adding extra condenser fan, additional pressurized coolant or four core radiators. But the question will it be sufficient to run Air-Conditioning? Will it be ok to run Air-Conditioning with extra output Alternator? Having installed the electrical winch, I’m also thinking of additional powered alternator, the current alternator is 65amps 12v capacity but I need something with 100+ amps. But the vacuum pump that is assisting the break booster sits behind the alternator restricting my options and increasing the money to be spent. 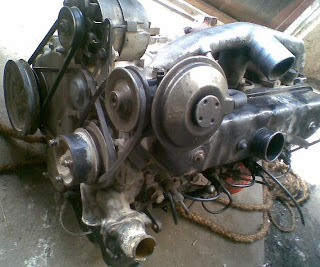 After taking all these issues in to the consideration, and the overhaul cost that may happen due to the age of my current Peugeot engine I opt to choose Peugeot XD3P 2498CC (2.5 liter) 72BHP dry liner engine that runs chain driven cam due to the super smooth driving compare to the older one. This one is much quieter than Peugeot XDP 4.9. The major advantage of choosing this particular model is that this engine mounting beds is same as the current one hence I don’t need to worry about any alterations in the engine bay. So far so good, however I expect few change to displace the air filter and battery and also clutch setup may require some attention. Air-Conditioning become easy as the XD3P engine is designed for such facilities in the vehicles it was originally installed. I have even got the clamps to mount Air-conditioner’s compressor. 10bhp additional power, which can take few extra pounds on my Jeep. Hurray bigger rims and permanent placement of my recovery kit with in the Jeep. Noice and Diesel emission is going to be heavily controlled as the XD3P is Bharat Stage II standard vehicle.